A campaign that has participated David Hayter. The car maker Ford is promoting a centered Metal Gear Solid universe in which participated David Hayter, the classic American bender Snake until Kiefer Sutherland has taken over in Metal Gear Solid V campaign: Ground Zeroes. Hayter has been itself that has been disseminated among fans that follow the campaign via his Twitter account. 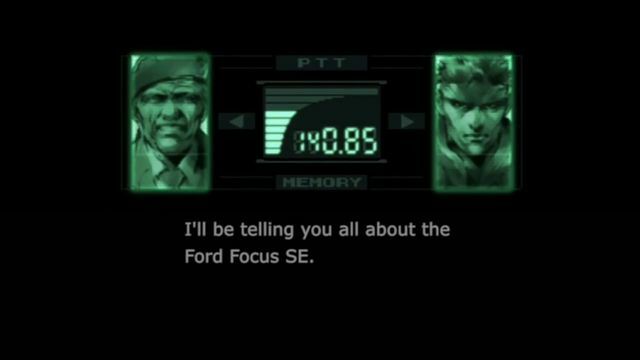 In a conversation over veteran codec saga, Colonel and Snake talk about the Ford Focus model. In another video, the fight between Snake and Psycho Mantis in Metal Gear Solid, of course also to the promotion of Ford in mind, this time for the new Fusion is resumed. This campaign is part of the series of videos called “Ford Overdubs”, in which the car company takes up sequences products popular culture and incorporates a new dubbing talking about their products, as the animated series Captain Planet and planetariums.